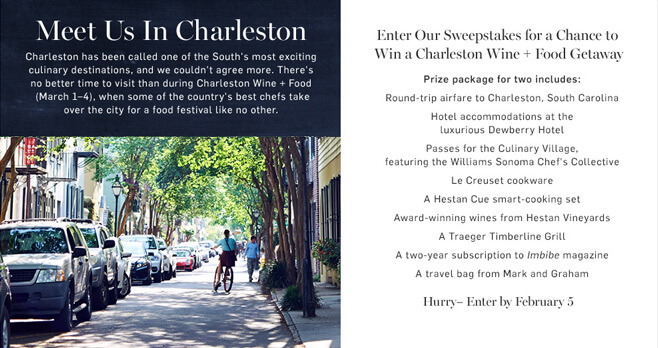 Williams Sonoma is sending one lucky winner and a guest on a Charleston Wine + Food Getaway. Register for the Sweepstakes online at www.williams-sonoma.com/charlestontrip by February 5, 2018 for your chance to win the grand prize trip valued at $4,995. Who Can Enter? The Williams Sonoma Trip to Charleston Wine + Food Sweepstakes is open only to legal residents of the 50 United States (and the District of Columbia) who are at least 18 years old at the time of entry. When To Enter? Sweepstakes begins on January 18, 2018 at 12:00 a.m. ET and ends on February 5, 2018 at 11:59 p.m. ET. What Is The Trip to Charleston Wine + Food Sweepstakes Prize? The Grand Prize consists of a trip package to Charleston, South Carolina.